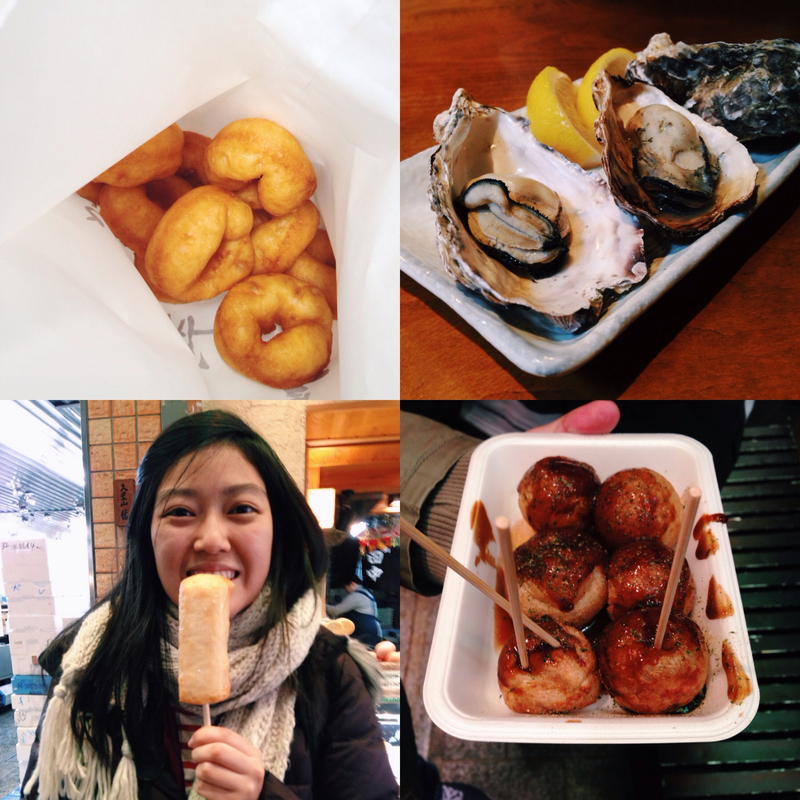 In January, I visited Kyoto & Nara with my friends, Sandra and Qy, as our post A levels trip. It’s the mandatory kind of overseas trip that you have to make with your friends before everyone parts ways and heads for university. 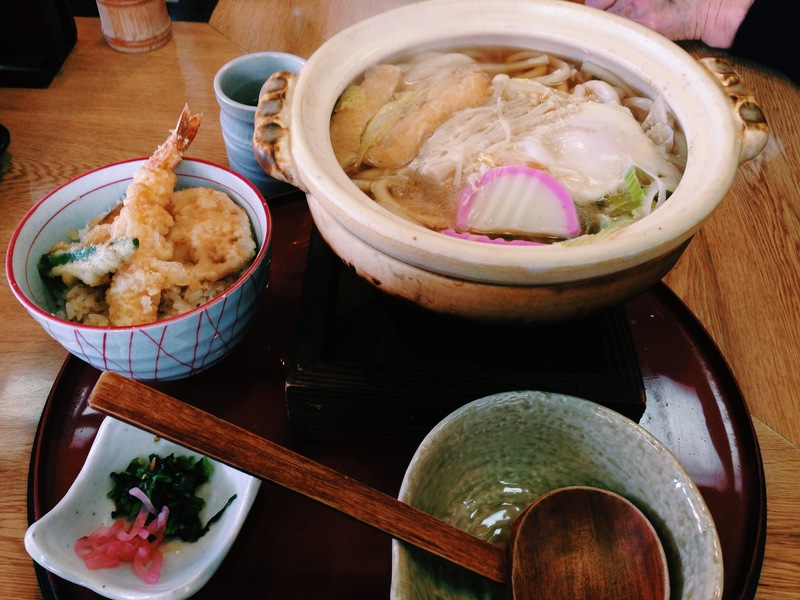 We decided on Japan because it was not a usual destination (us being hipster haha) and we love Japanese food. Everyone thinks that Japan is an expensive destination but it really isn’t if you manage to find the cheapest flight and the cheapest accommodation. We took Malaysian Airlines, which on hindsight wasn’t a very good decision, but it was the cheapest full service flight and only a hundred bucks more expensive than a budget airline flight. I dislike taking budget airlines because the price they state isn’t always the price you pay. I’ll still have to pay for the luggage and the airport taxes; all the miscellaneous fees makes me go mad. The Malaysian Airlines flight was one of the cheapest because it had to stopover at KL International Airport, which is a really basic airport. The only thing you can do there is eat and drink coffee but wasting 2 hours with my friends didn’t feel that long because of the company. If you’re wondering, we paid about $500 for our roundtrip air tickets. Although we landed in Osaka, we decided to give sightseeing in Osaka a miss because it was just another city filled with shopping malls and shopping in Japan isn’t one of the most exciting things in the world. 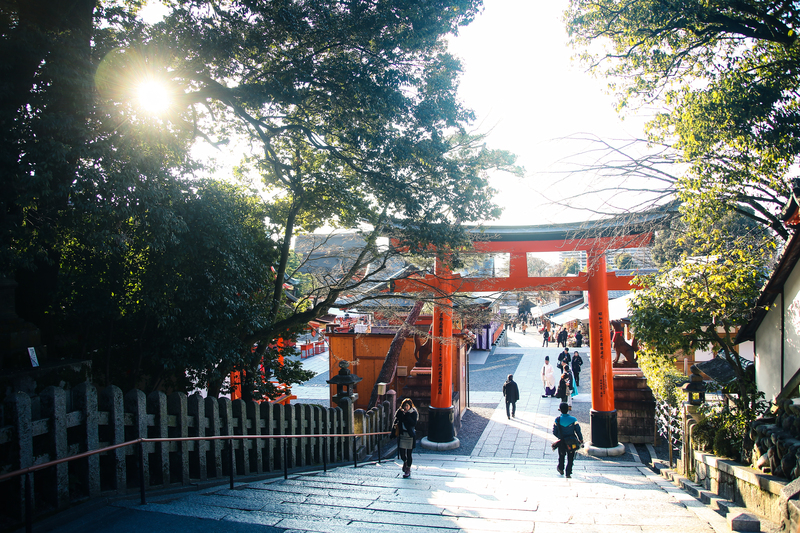 We headed straight for Kyoto, formerly the imperial capital, a city filled with cultural sights and good food (as with any part of Japan). 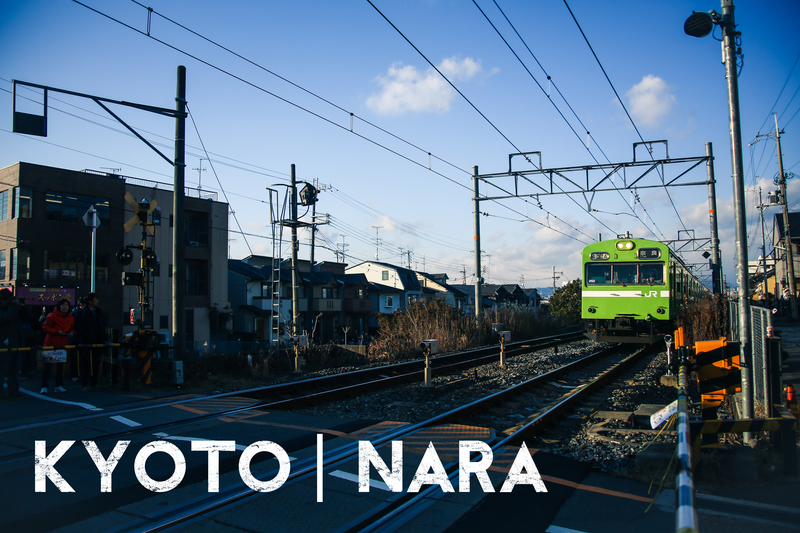 We spent 4 days in Kyoto before heading out to a small town called Nara, famous for its deers, near Kyoto and spent 2 days there. It is really easy to take a train from JR Kyoto Station to Arashiyama so there’s no excuses for not doing so. 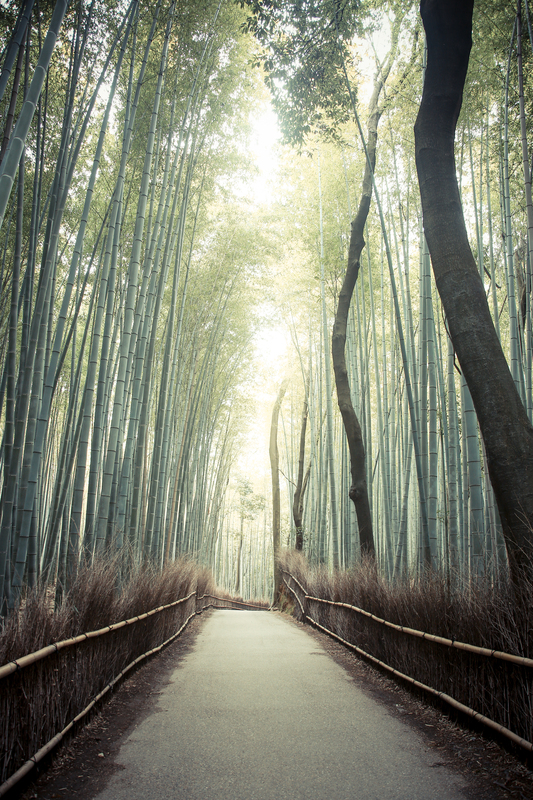 Arashiyama is a small area that can be walked so take your time to spend a day here. We didn’t have a particularly good meal here since everything was pricey with it being a tourist attraction but the sights made up for it. The bamboo forest was breathtaking, the only thing missing was a cute fat panda bear. It’s not a very long stretch of bamboo but long enough to get the peaceful feeling of being amidst the green. We also visited a Unesco heritage site for a temple which was just like another Japanese temple, I’m sorry I can’t appreciate such cultural treasures. 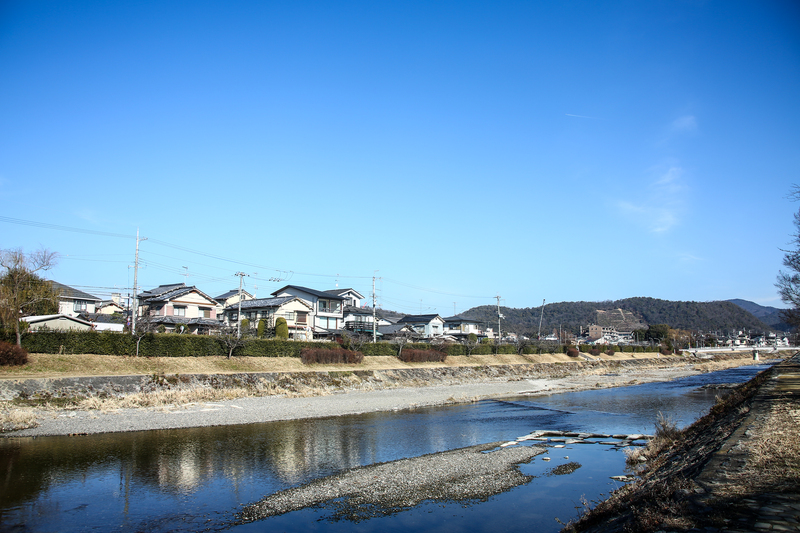 Arashiyama has a river in the middle where you can paddle boats or just sit at the bank to enjoy the beautiful scenery. We didn’t pay to enter the monkey forest since we have so many monkeys in Singapore and we can see them for free anyway, but we stopped in our tracks for a musical box shop, contemplating whether we should buy a pretty Japanese musical box back home. I mean it’ll be cool to have a Totoro spinning round while playing the Totoro theme song right? Sandra and I rented bicycles from Kyoto Cycling Tour Project because they rent helmets too and we, being afraid of dying in a foreign land, had to find a shop which rented bicycles and helmets at the same time. In my opinion, renting the bicycles wasn’t too expensive, it was 1000yen for a day. Being amateur cyclists, we didn’t cycle to travel to places because we wanted to avoid cycling on the roads. 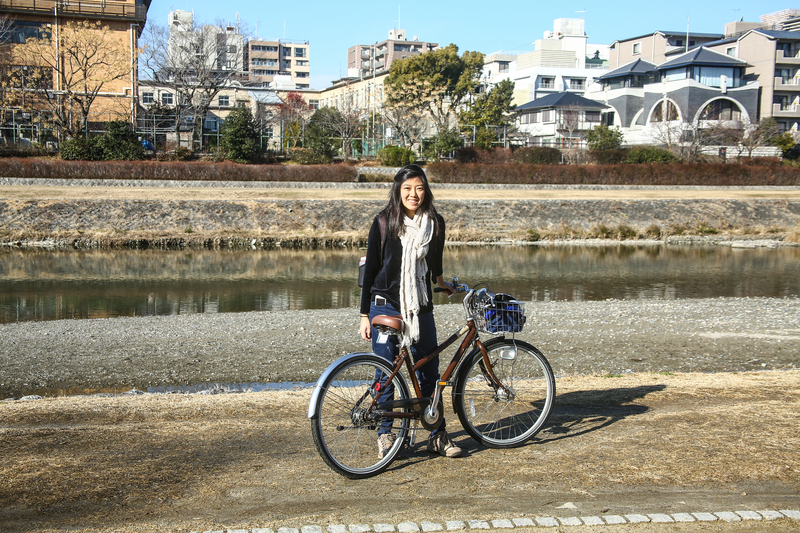 Instead, we just wanted to cycle to enjoy the scenery so we chose to cycle along the Kamo River. Well, we had to cycle along the streets and try not to kill pedestrians along the way but cycling along the river was easy peasy. 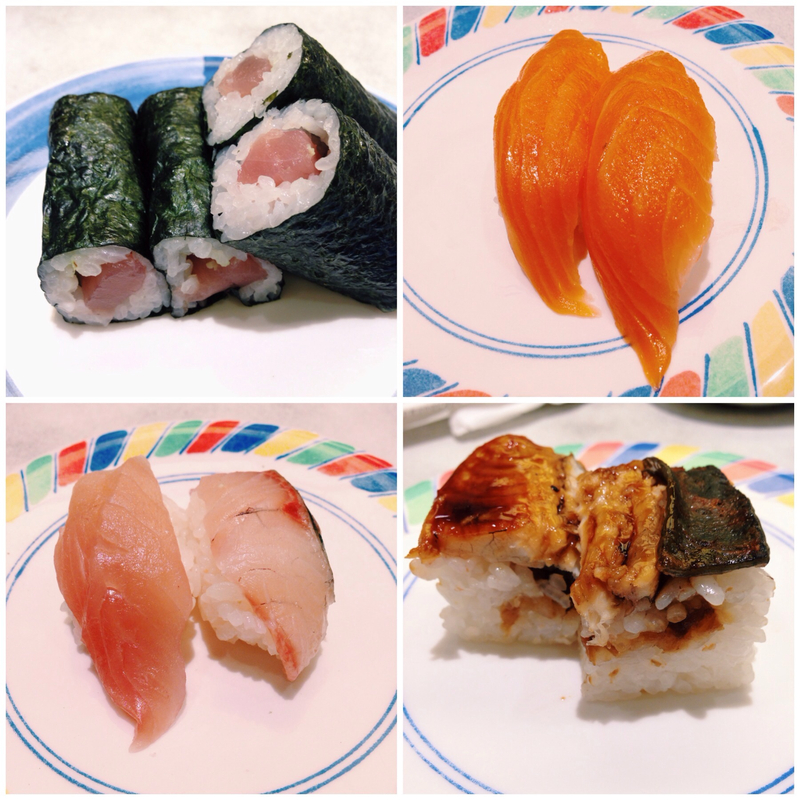 It’s a different way to see Kyoto and a calorie-burning way as well so that you can make way for more sushi to come. It’s just a really pretty temple, that’s all. 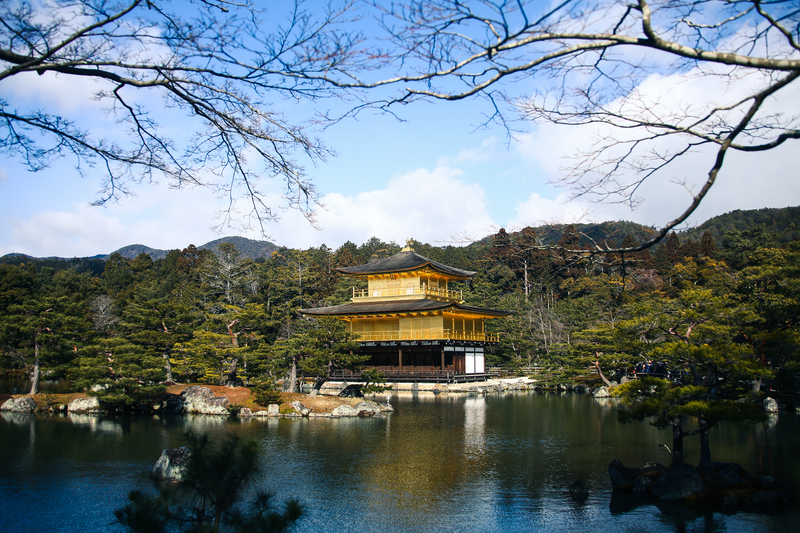 When you go to Japan, you’ll have to visit one temple at least and the best temple to me would be the Kinkakuji. If you’re not a temple fanatic like me, just visit this temple and be on your way to your sushi restaurant. 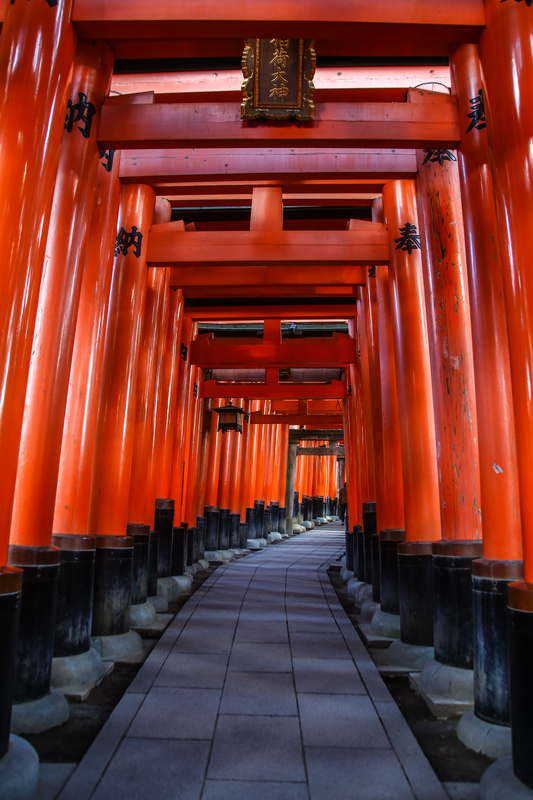 What makes this place unique is the thousands of red wooden shrines. The first time we saw it, we took photographs with it at any opportunity that we could but after that, it got very repetitive and we became quite bored. This place is situated on a hill which means a lot of walking. There also appears to be some mistake with their maps, we walked for quite a bit already but the map showed that we only walked a very short distance. When all of us saw the map, we were like WHAAAT and we gave up. We weren’t the only ones daunted by the map, a lot of other tourists turned back too. Try spotting a real geisha. 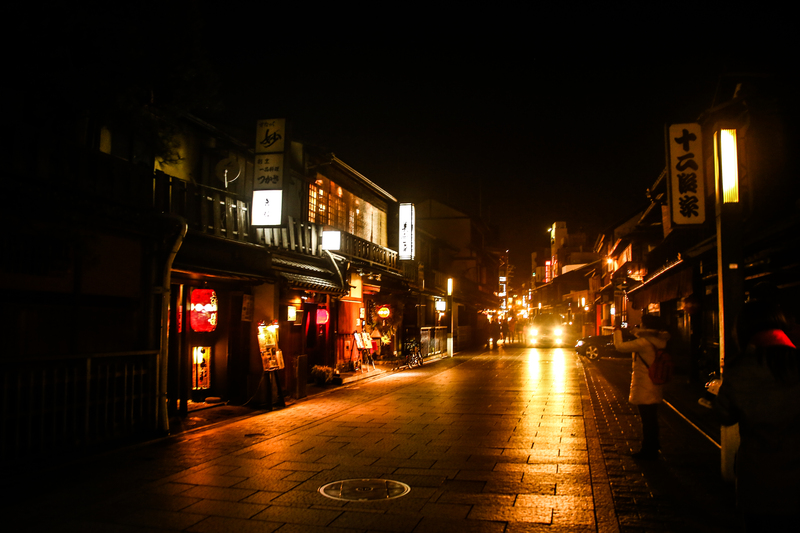 It’s easier if you walk the back alleys of Gion during dusk to see the geishas shuffling from one house to another. Don’t worry if you don’t manage to spot any geishas. 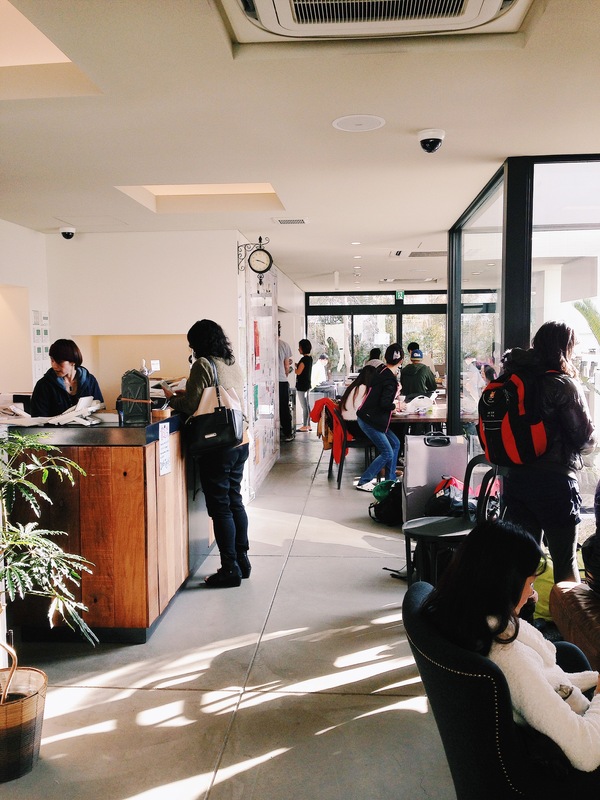 There are plenty of matcha tea houses around for you to drown your sorrows in green tea. Apologies for the inability to find the name of the restaurant but it’s difficult to miss this place because it is packed no matter what time it is- morning, afternoon or night. This meant that we ate our sushi whenever we wanted to, for tea, dinner or supper 🙂 Furthermore, it’s in Kyoto Station which makes it convenient for you to eat it any time. I’m sorry that I do not have the exact address of the shop because it really isn’t a very famous touristy restaurant. QY was crazy over kaiten sushi (conveyor belt sushi) and wanted to eat cheap and good sushi so we asked the waitress in this cafe near Nijo castle where we could find good kaiten sushi and she directed us to this place. It’s a place where locals frequent, we were the only tourists around and there’s a long queue to enter this huge restaurant. You have to get a queue number, sit and wait for your turn. 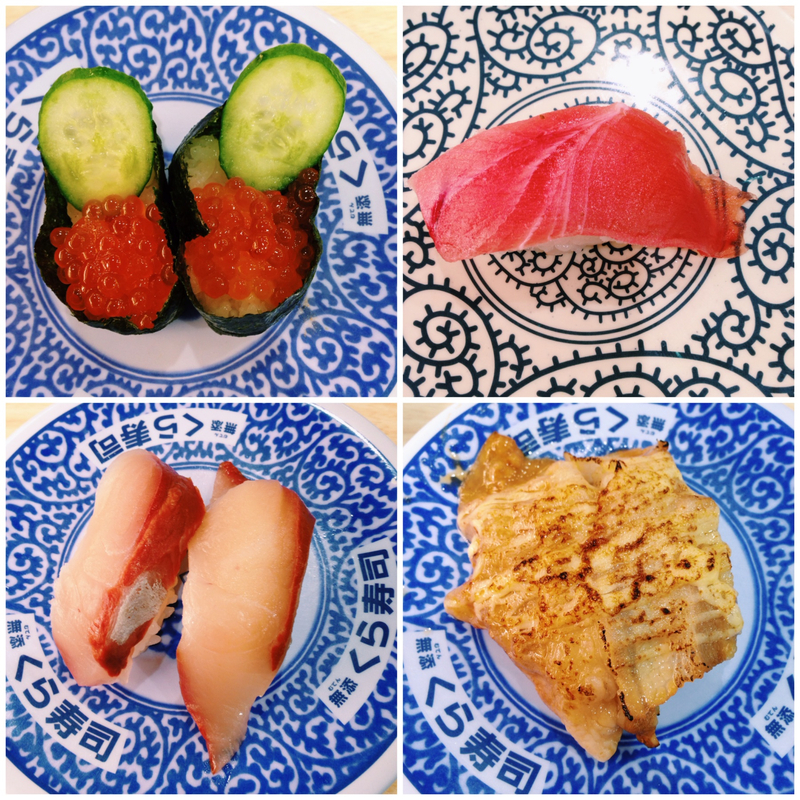 For 130 Yen, which is about S$1 something, sushi can’t get any cheaper. The quality of the sashimi is really good, as with most places in Japan but one thing different about this restaurant is that it serves really delicious cooked sushi. The beef sushi with some special Japanese mayonnaise on top was perfect and so was the seared salmon belly sushi. n food here. This is a really small Mexican place that serves really good quesadillas (cheese cheese cheese!!!) although it is really difficult to find this place. If you don’t look carefully, you’ll just walk right pass this restaurant. It’s more ideal to find the place when it’s bright because I think you’ll get really scared walking down dark alleys trying to find this place. Go ahead and try all the different Japanese food this market has to offer. Don’t bother paying 400 yen for that fishcake, I regretted paying so much for it. If you are an oyster lover, you have to visit the shop that sells oysters at the start of the Market. There will be this guy shucking and barbecuing oysters outside. At first glance, I thought no one visits the shop because there seemed to be no one from the outside but I was so wrong. To eat the oysters, you have to be seated in the restaurant inside, and the restaurant is packed full of people indulging in oysters. 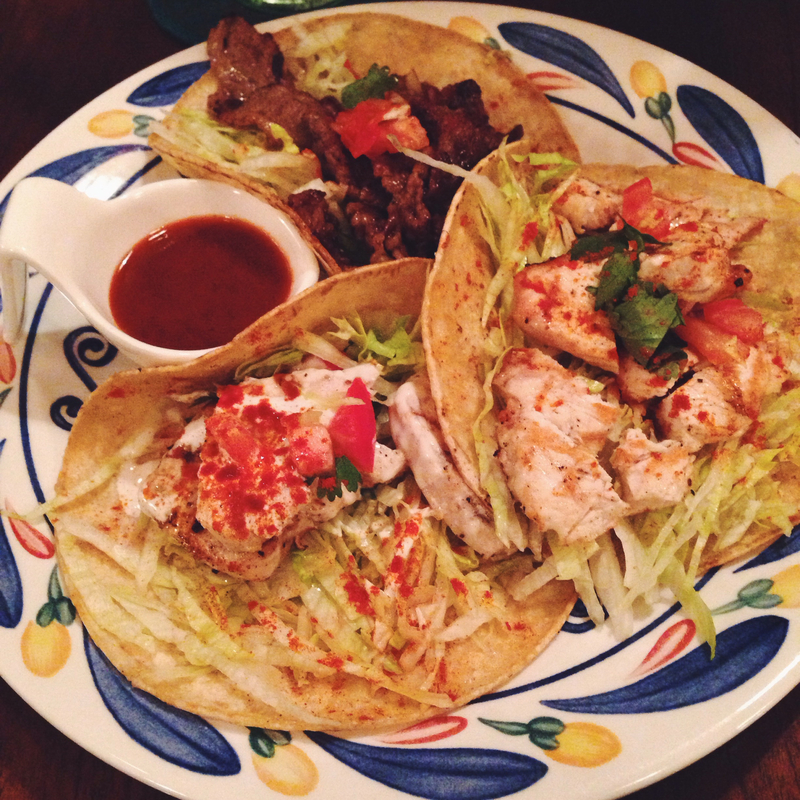 Try both the barbecued and fried oysters, you won’t regret it. I love the barbecued oysters more though because of the smoky smell and how the oyster is half-cooked. Another hit for me were the tofu doughnuts. The last time I went to Kyoto, there was a long queue for the doughnuts and I didn’t get to try it but this time, there was no queue at all, probably because it was winter and a weekday. The shop selling tofu doughnuts is quite conspicuous, probably around the middle of the Market. If you are still feeling hungry after your food adventures in the market, you can go try Ippudo ramen near the start of the Market. It’s a huge bowl of ramen but they serve the thin kind of ramen which didn’t satisfy me. I love my chewy thick ramen! 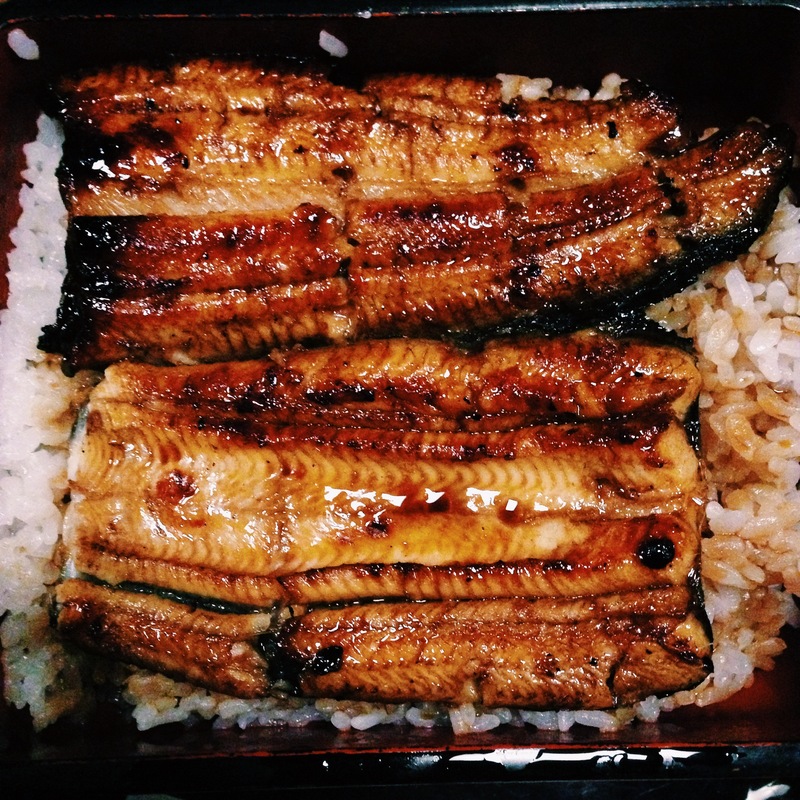 The unagi rice is really so damn good. It’s pricey, I admit, but it was the one meal that we all decided to splurge simply because you don’t get fresh eel anywhere in Singapore. It was also quite an experience to sit on tatami mats and watch the waitresses turn large tables into smaller tables simply by moving the bamboo screen that separates one table from the next. There were many locals, a sign of good food, and the restaurant doesn’t accept reservations, another sign of good food, so be sure to go early because there is sure to be queue in the restaurant during meal times. The pudding is to die for. I tried the original caramel flavoured one and only bought one small tub, a decision I deeply regret in hindsight )’: There was a huge bottle of pudding on sale, I guess it’s a family size for everyone to dig in and share or just the right size for a greedy pudding lover. Anyway, when the first spoonful of pudding slipped into my mouth and melted, I was in bliss. 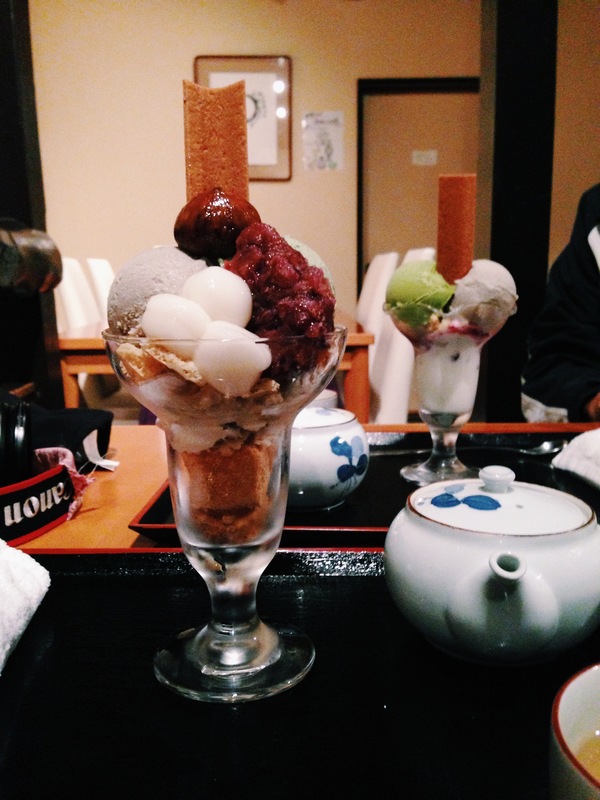 I was depressed that it was my last night in Nara which meant that I couldn’t go back to buy more pudding to eat. It was really that good. My friends tried the cheese flavoured one and said it was good. Yup, they have a whole range of quirky flavours you can try. I doubt you’ll ever get sick of that sick pudding. Tel: 0742-27-5036 / 1307-1 Takabatake-cho, Nara / Open: 11:00-15:00 (reservation only for dinner time) / Closed: Thurs. I can’t stress how much you have to go eat at this place, it’s probably about S$13 for a set that consists of noodles, rice and tempura. They are good with their udon noodles, most people order it in a huge clay pot and you eat it with a huge spoon too. 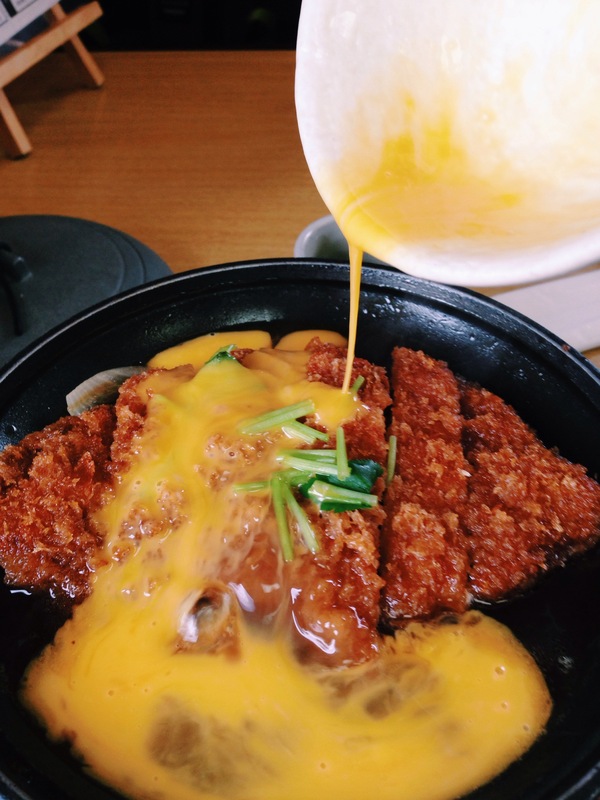 Also, you have to try the tonkatsu simply because the way they cook it is so fascinating. The fried tonkatsu comes in a cast iron kind of pot, you lift up the lid and pour the raw egg in, coating the pork with all that eggy goodness, place the lid back on and wait, rather impatiently, for that tonkatsu to be ready with his fellow eggsmen. 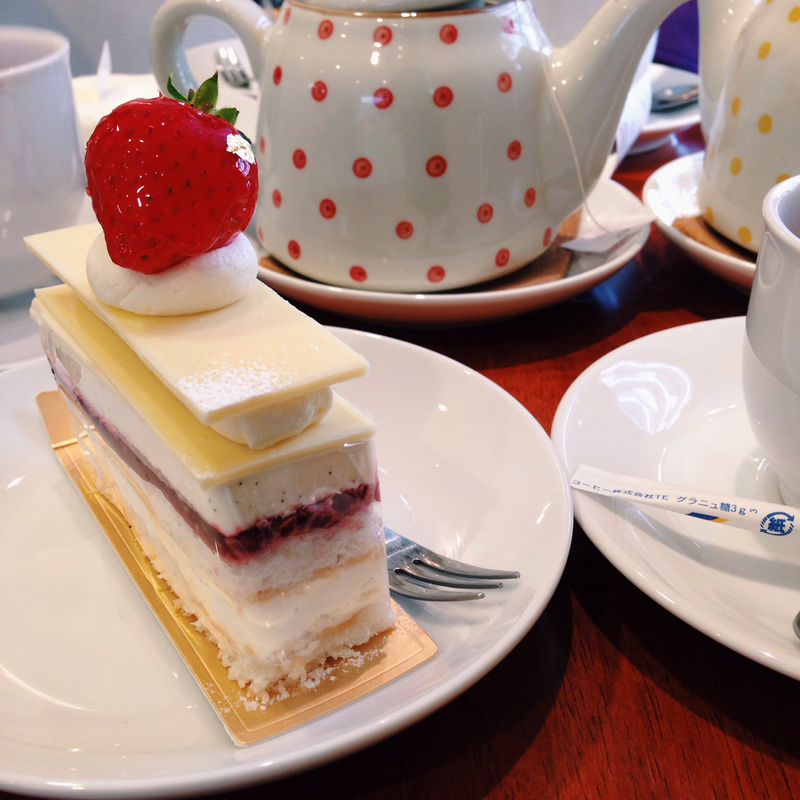 Compared to Singapore cafe prices, this place is really reasonable for their cakes. Their cakes are priced at about $3 something Sing :O And the best part is if you sit there and eat their cakes, they serve you a free pot of tea (or two). Anything free for a Singaporean is a plus point. I tried their white chocolate cake (good) and the mont blanc (so-so). 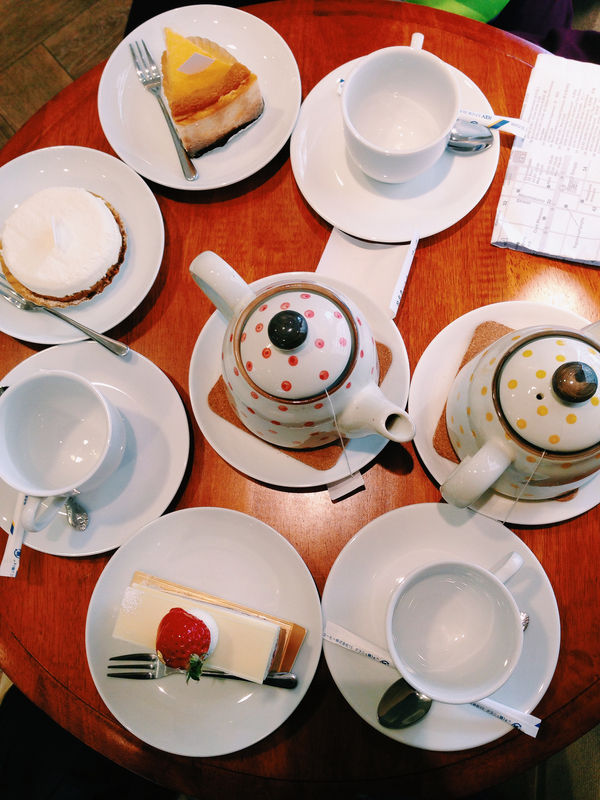 But if you’re looking for a tea time place to rest your feet after walking round the town, here’s the place to relax. There are only two tables but in the 3 hours that we were there, no one else sat down. Everyone else walked in to take away cakes. We were also the only tourists there, which made them quite fascinated with us I guess, so go enjoy this gem near the JR Nara Station! We took about an hour to find this place because the woman at the information counter gave us the wrong directions. Basically, google maps this place out before you go on your trip. This guesthouse is only a 5 minute walk from the JR Nara Station which made it an ideal choice for us because we had to leave at 6am to take a train to catch our flight home. The rooms are comfortable and clean, fulfilling the two most important criteria I have. There are bunk beds for 4 in a room and a double bed and tatami mat for 3 in a room. They have a PlayStation 3 in the common area and a TV where you can choose from a whole selection of movies. We watched The Matrix there. The receptionist was really helpful with all our questions and you have to take their map which states where all the good food is.